Despite skepticism over Chinese firms seeking partnerships or investments in the US and Europe, there are more venture capital (VC) investments in Chinese artificial intelligence (AI) startups than in their US counterparts, according to GlobalData, a leading data and analytics company. 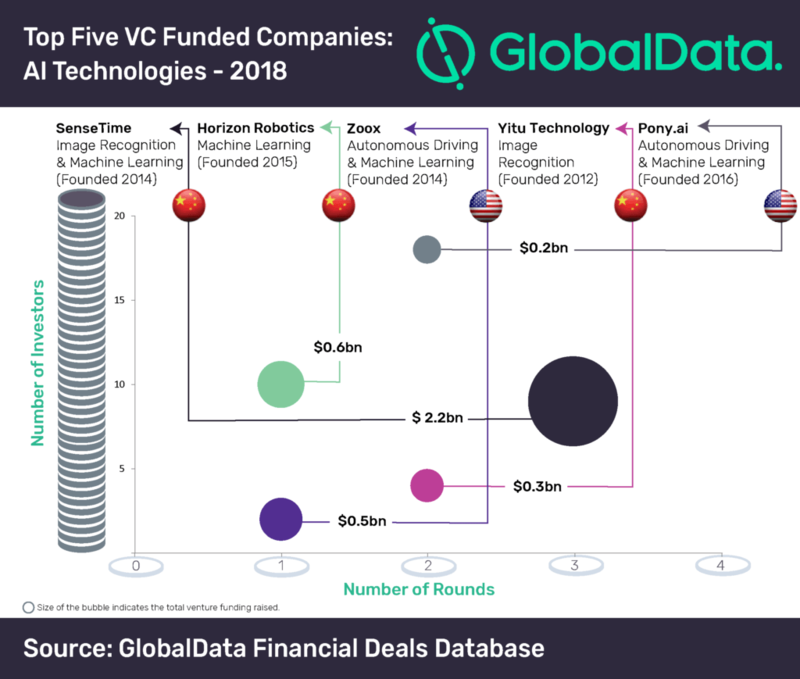 An analysis of GlobalData’s Financial Deals Database reveals that China accounted for three of the top five VC funded companies in AI space in 2018 while the remaining two companies were American. The Chinese companies raised a total $3.1bn in VC funding, whereas the American companies collectively raised $0.7bn during last year. Tech giant Alibaba-backed SenseTime, which works in the areas of facial recognition, machine learning, robot sensing technologies and autonomous driving, raised $2.2bn. Two other Chinese companies, Horizon Robotics and Yitu Technology, collectively raised $0.9bn. Horizon Robotics develops machine learning AI chips and Yitu Technology works in the area of facial recognition. The two US-based companies that made it to the top five VC funded AI tech companies’ list in 2018 included Zoox and Pony.ai. Both the companies are active in the field of autonomous driving and machine learning.